Good Afternoon Messages for Him : When we wake up, if we get a good morning wish from our loved one, our morning becomes sweet. But in the afternoon when we are alone and busy with our work, a simple good afternoon wish can make us feel better. Maybe your husband/boyfriend is under stress due to heavy work. A lovely good afternoon message can relive his stress. 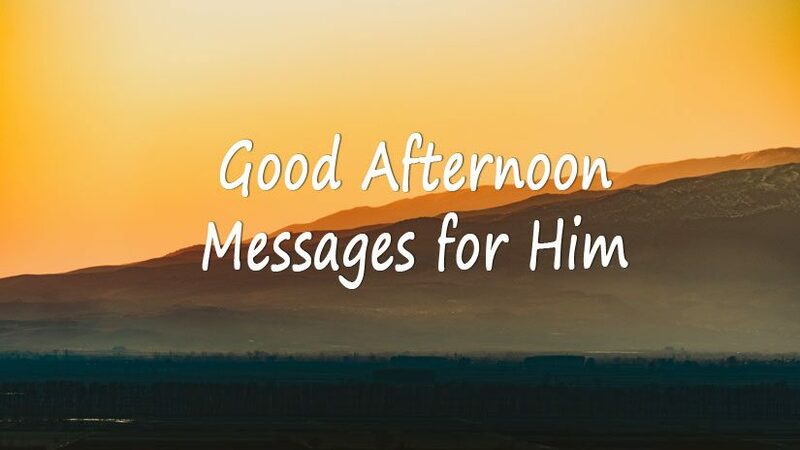 You can call this lunchtime message, where you write him to take care of himself with some sweet and romantic words. This message can be an inspiration for him. Even it can make his day better. 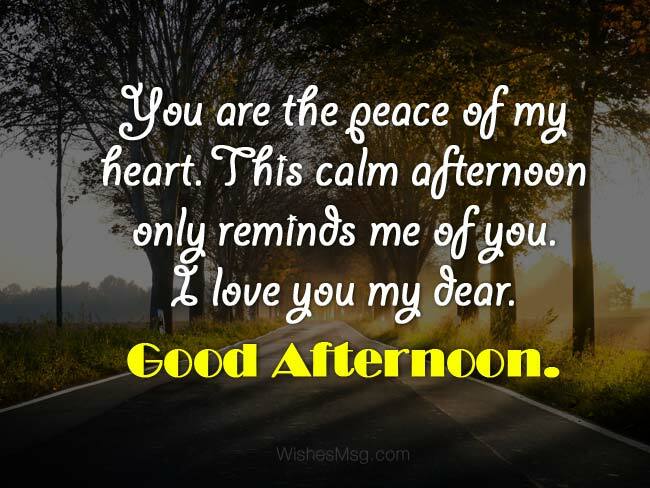 Here are some sweet, adorable good afternoon messages for your special one. I love you my sunshine. Every morning I look at your face and literary it shines. I am sure you shining brighter on this lovely afternoon. Happy afternoon my love. In this beautiful afternoon, I wish I could sit and talk with you. You always make the beautiful thing more beautiful. Good afternoon dear. You are the best man in this world. In this sweet afternoon, I want to tell that you have made my world beautiful. Good afternoon. Enjoy your lunch. If you have tons of works to do, I know you can do the works very well. Because you are a jewel. Good afternoon dear. Hope you have a wonderful afternoon. This glowing sun is reminding me of you. You always glow like the sun. Your love enlightens me. Good afternoon my love. After the beautiful morning, this amazing afternoon has come. I miss my king badly. I wish you an amazing afternoon my king. I love you. In this lazy afternoon, I feel incomplete without you. I wish you could be here with me. I love you. Good afternoon my sunshine. 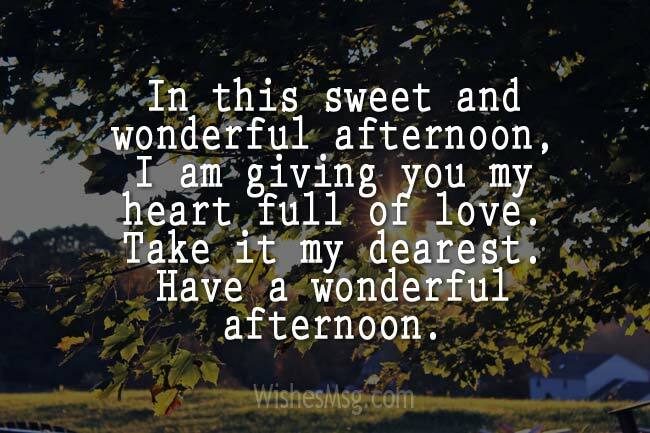 In this sweet and wonderful afternoon, I am giving you my heart full of love. Take it my dearest. Have a wonderful afternoon. In this beautiful afternoon, I feel good. But it could be best if I can hug you. Good afternoon my dear. Take a tight hug from me. The sunlight is touching my hair, my hand. I am sending this sunlight to you. Feel the touch of mine. Good afternoon honey. Imagine we are walking holding hands beside the ocean. Feel the blue water, the blue sky, and fresh air. Feeling great? I wish you a good afternoon like this. You are the peace of my heart. This calm afternoon only reminds me of you. I love you my dear. Good afternoon. In this beautiful afternoon, I want you to know that I love you very much. I can’t live without you. I want you all the time beside me. Good afternoon dear. You are my apple of eyes. When I close my eyes I see your innocent face. You have completed my life. I love you. Good afternoon my love. You love is divine. Your love has made me a strong woman. I am proud to have a partner like you. Have an amazing afternoon. Love is like life. So you are my life now. I wish my life a good afternoon. Enjoy your lunch honey. In this afternoon you are hot and tired. I have sent this message to cool you down. So read my messages and feel cool! Happy Afternoon. I have sent you some sunshine my love. Sorry, it is hot. But don’t worry. The evening will come soon. Good afternoon dear. You know the sun is in the middle of the sky because it wants to see you! Happy afternoon. Enjoy the sun and love me. This message has traveled a long way do you know? It has traveled my room, my building, the roads, the trees and finally your phone to wish you a happy afternoon. Honey, I just want to say that don’t be burnt out, as the sun is very hot in this afternoon. Have a great afternoon with a glass of cold tea. I like your tanned skin. But that doesn’t mean you have to stay out in this afternoon. Stay cool and enjoy the afternoon my love. I wonder why the sun is so hot. Maybe it is burning with jealousy because there is a handsome man in this world. And it’s you! Good afternoon my man. I wish you a happy afternoon with a glass of cold lemonade and a chocolate ice cream. Tomorrow please buy me these. I love you. The afternoon is a classy time for everyone. 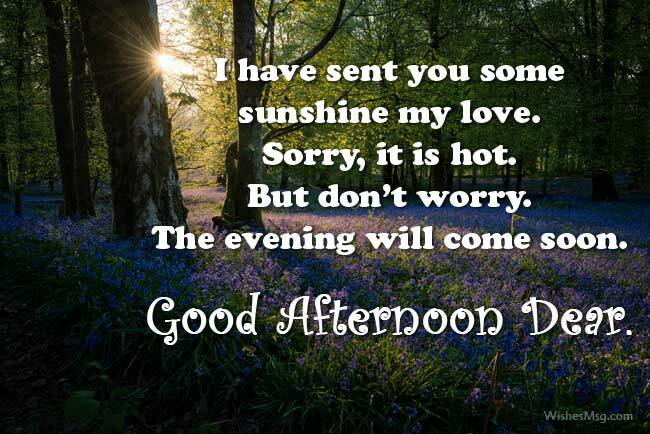 So make it more enjoyable and attractive by sending these adorable afternoon messages to your love. He will love it surely.